The show airing July 30, 2018 – August 6, 2018 ‘highlights’ the YWCA’s Resolve Family Abuse Program & Girls Night Out event. We interviewed Julie Haden, Director of Resolve Family Abuse Program. She discussed an overview of the program. The YWCA Resolve Family Abuse Program offers 24/7 shelter, a crisis hotline and emergency intervention for victims of domestic violence. YWCA Resolve provides services for the entire family in Kanawha, Clay and Boone counties. YWCA Resolve also offers case management, court advocacy, counseling, support groups, safety planning, monitored parent-child visitation/exchange, parenting sessions, and programs for children, teen dating safety and batterers intervention/prevention. Licensed by the West Virginia Family Protection Services Board, the program’s mission is to eliminate domestic violence through leadership, education, empowerment and community collaboration. Last year, YWCA Resolve served 2,361 individuals (unduplicated), provided 3,986 shelter nights to 183 victims and their children, provided 6,965 hours of case management, advocacy, counseling and support groups, staffed a 24/7 crisis line with trained DV advocates, and provided a host of other services. If you are reading this, and would like to make a confidential and completely private call, their number is 800-861-8663. We also interviewed Amanda Easter and Sandy Call, co-chairs of Girls Night Out. Initiated in the fall of 1998 by Sandy Graff and Elsie Carter, Girls Night Out—a “Party with a Purpose”—was the brainchild of the High Hopes Committee—an amazing group of volunteer women who were determined to help the YWCA Resolve Family Abuse Program in its efforts to eliminate domestic violence. Now in its 19th season, more than $1 million has been raised over the years to assist the YWCA Resolve’s shelter, Hope House, and support YWCA Resolve in continuing to provide shelter, services and programming. Originally, the High Hopes founders and their committees hosted up to 17 different parties each summer – ranging from art walks, tennis parties, Italian feasts, and game nights to fashion shows, antique shows, and even car shows. 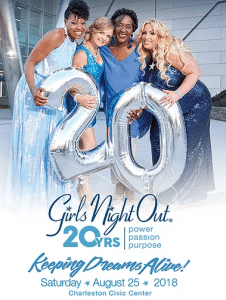 Now, 20 years later, these smaller parties have been rolled into one grand event: Girls Night Out. This year that night is August 25, 2018 at the Charleston Civic Center beginning at 6:00. Plenty of food, drinks, fellowship, music, dance and girl fun await you. And remember: It is A Party with A Purpose. Click here for more GNOWV information.